Seven years since this blog was born. Since then, I’ve created two children, a book and enough grey hairs to make a toddler’s Halloween wig. Readers have come, gone and then come back again. Comments have dried up, but the drivel I write shows no sign of abating. Let’s hope the visitor numbers aren’t being generated on a click farm in Dhaka. I was gearing up to write a sentimental post. You know, the sort that would give away my ripe old age. About how times have changed, it’s all about short, sharp and snappy. Blogging is just not how it used to be… yada yada yada. This vegan just happened to be staying the night at our friend’s place, who was coming over for dinner with his wife to learn to make dal. As if the combination of a vegan and dal virgin home cook could not get worse, I also had Boobie over: strict meatarian, white wine and fag fiend and general giver of much opinion. It didn’t take long for the interrogation to start. So, why don’t you eat meat. Unfazed by the two meat loving, Indian fishwives, he explained his fine stance against cruelty to animals. So how about cruelty to mankind? Again, a fairly robust defence. He was a University lecturer after all. Conceding defeat, I topped up his Vegan wine while Boobie threw him a fag. Then we both declared Indian food would be our cuisine of choice if we ever decided to go vegan or vegetarian. So much variety, who would miss meat? Like this recipe: Dill Baingan Bhaji. 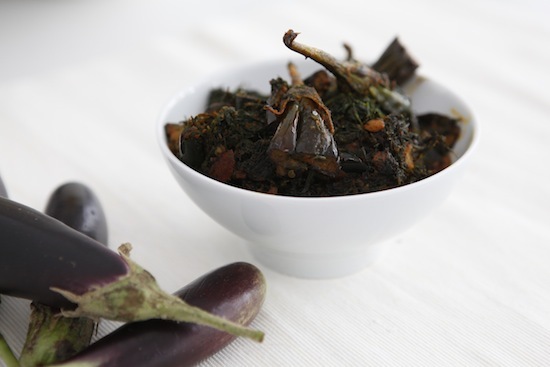 Nothing more than aubergines/brinjal sauteed with spices and dill leaves (sowa/soya/suva saag). I adore dill recipes, but something about its pungent grassy taste alongside the silky aubergines makes this recipe sublime. Here’s to learning something new every day. Dodging the seven year itch and blogging my way through life’s every lesson. Wishing Sia, Sra, Jayashree and Mandira happy big seven. No mean feat ladies. And to Ganga, a proud vegetarian, for celebrating 17 years of blogging! Something to aspire to. Wash and slice lengthways two times through each aubergine leaving the tops on. Roughly chop the garlic pieces. In a medium non stick pan, bring the oil to heat on medium high. When it’s hot, sprinkle in the asafoetida, toss in the seeds and garlic. As they sizzle up, mix in the aubergines with the turmeric and chilli powder and saute until soft for five minutes. If you cover the pan with a lid from time to time, it will speed things up. When the aubergines are soft, mix in the dill, add salt to taste and cook until you can see wrinkles on the aubergine and oil leaving the edges of the pan. This dish is almost steam cooked in the aubergines own juices. But if your masalas start getting stuck to the bottom of the pan, you can add a teaspoon of water to scrape it off. This is delicious tucked into a warm roti. Congratulations on seven great years! I can’t recall when I discovered your blog, but it was quite awhile back and I’ve loved it ever since. This recipe looks divine – I absolutely love anything with aubergine (although here, we call them eggplant). And it looks easy, which is always appreciated! I think I have been following your blog for at least 5-6 years and come back for more even now 🙂 Your Butter Chicken recipe is a hit amongst my family/friends and yours is the first blog I refer to when I am looking for a quick indian recipe! Congrats on completing seven years Mallika. Looking forward to several more years of blogging from you. Mallika, so glad to see a vegan recipe – I am a vegetarian and have made a number of your recipes which always receive rave reviews from my whole family, especially my kids who often tell me I have to make dal for them! It is always fun to read and then yearn over the delicacies you create. Of late no time to comment that is all but read most of them. Here’s is to Happy Seven and to many more! Happy happy Seven to your lovely blog Mallika. Mine is next month sometime I think. Amazing no, that with kayanaat and all that, we all started talking food some seven years ago. So many great vegan recipes on your website 😉 I’ll be trying this dill recipe this weekend, I hope. Happy blog birthday. I am so pleased to share my blog birthday with yours (like some proud mommy club;)). I thought about you when I wrote my blog anniversary post. I thought I sent you the message but looks like I missed it all together! Wishing you many many years of blogging honey! You do know that I love your writeups, don’t you?! Happy blogiversary! Yep, Indian cuisine is always a safe and consistently tasty fallback for us vegos. Mallika, I have read and loved your blog for the entire time that you have been writing it. And I still subscribe to it, read every post and have tried out several of your quick fix recipes. Yours was the first blog I discovered, back in the day when cook blogs and weren’t yet all the rage. You are amongst those who set standards and inspired so many of us to give it a go too. Happy 7th! And here’s too many many more! Laurie, thank you! I remember your very first comment because I swung by to see your blog straightaway. Chinmayie, that’s so cool that they enjoy it! Thanks a ton for the years of support. Andrea, great to hear that. Love that your kids enjoy dal. Actually I cooked dal with no ghee for him, just an oil tarka and it came out really well. Vegan dal, anyone? Indosungod, I have the same problem. Sometimes I try and the comment doesn’t even go through. Really frustrating! So nice of you to stop by. BongMom, there was something in the water. I’m going to look out for your 7th birthday post. What a fantastic achievement just in time for the big birthday too – the book!! Revati – that is so sweet and thanks so much. It’s really hard to feel motivated all the time but comments like yours make it all the more worthwhile hon. Alex – welcome to the madness. Congratulations! So now the 7 years itch is gone, and you are happily stuck with your blog forever! 7 years back I didn’t know what a blog was Mallika – I have been a late bloomer! This is the first time I’ve posted to one of your recipes but certainly not the first time I’ve made one! “A Big Dill” caught my interest as I a long time vegetarian (loved your story) and enjoy a good aubergine recipe. My attempt at this dish went quite well despite the fact I forgot to add the dill in the end (sort of like a dry Bhindi Masala – without the tomatoes). Thanks for sharing your creativity! Yay for a wickedly funny blog and its creator! May you blog and book for years more! As you can see, I went back into hibernation after that anniversary post last month, otherwise I would have seen this post faster! Hi Ishita, hope I survive the 7 year itch. Thrilled that you like my book. We need an across pond recipe swap! Hi Mike, so pleased the recipe came out well. With or erm, without, the dill! Thanks a ton for leaving a comment, you make it all worthwhile. Congratulations on the blog anniversary Mallika! wishing you many more to come!This is one of those blogs that I come to, even after losing all my lists after a popular reader died… i come here because I enjoy your stories and the recipes are always fuss free and super quick…. Thank you for this! This was my first attempt at making Indian food and it came out amazing. I’m not a vegetarian but I’m crazy about eggplant, and I stumbled on your blog while searching the internet. You have a delightful style of writing that really transports me away from here- I live in a smallish city in Tennessee, USA. First, congratulations:)I happened to find your site a few days ago and its become my favourite time pass to cook now. I am a newly married woman who left work to move places with husband… it was highly frustrating to do nothing and brood over things for not having a job! but now, I look forward to being in the kitchen! Thank you 🙂 Looking forward to many more from you.. I just discovered your blog and fell in love with it immediately! Absolutely love your style of writing and the quick recipes. Like you I also started cooking when I came to the US to study and back then there were hardly any resources for newbie cooks and none with simple recipes like yours. This eggplant recipe seems interesting, will try it soon. I had chicken with dill and cilantro but never thought dill and eggplant would go together. Congrats Mallika, I know I am so late..came here to greet you on new years and saw this post..:)..Happy New year to you and your family!